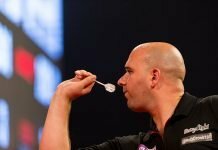 A quick overview of the basic rules for keeping score in darts. 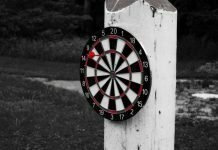 The correct method of darts scoring depends on the game you’re playing. But there are certain rules you must follow in all games. 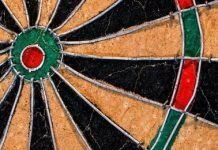 Here, we’ll help you master the basics of darts scoring so you can quickly get started with the most popular dart games, such as 01 games (301 and 501) and Cricket. First thing’s first: Proper darts scoring requires a scoreboard. 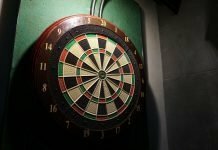 If you play on an electronic dartboard, the scoreboard will most likely be attached to the cabinet and can be programmed to automatically record scores. If playing on a traditional bristle dartboard, you can use a basic chalk scoreboard or dry-erase board. A dart scoreboard should have printed grids for Cricket and 01 games. If the scoring grid is not pre-printed, then you can easily create your own grid on a blank board. The dart scoreboard should mounted within 4 feet from the dartboard at no more than a 45 degree angle from the board. The scoreboard should also be clearly visible in front of the player at the throwing line. Along with a dart scoreboard, you’ll need someone to keep score. In most cases, that will be you or your opponent in a friendly match. In serious league games or sanctioned tournament, you must have an actual “chalker” keeping score. If you’re playing in a league event or sanctioned tournament, you must have someone acting as a ‘chalker’ to keep score. However, most of us are just playing for fun at the bar. In this case, make sure you leave the darts in the board until your score is recorded. A scoring dart must stay in in the board for at least 5 seconds after the final dart has been thrown in a turn. For 01 games, the chalker (or you) will mark the scores made in a turn in the outer columns of the scoreboard. The total remaining score will go in the two middle columns. You can ask the chalker what you scored or how many points you have left. But you cannot ask the chalker about out combinations. For out combinations, you need to consult and memorize your 01 out chart. If you throw a dart and it lands between connecting wires on the board, your score will be the higher of the two wedges in question. Related: Learn about basic dart throwing mechanics to throw more consistently. Accurate darts scoring is a true test of our basic arithmetic skills. If you make a mistake in your arithmetic (i.e. error in subtraction in 01 games, or error in addition in scoring Cricket matches), that mistake must be corrected before your next turn. In doubles, the mistake should be corrected before your teammate’s next turn. If the mistake remains when you or your teammate starts the next turn, the score will stand as written. The above principles apply to most if not all games. Below are some specific rules to be aware of when playing 01 games or Cricket. Darts scoring in 01 games like 301 and 501 is pretty straightforward. Depending on the game you’re playing, you start with the total number on top. So, for a game of 501, you would start by writing 501 at the top of the scoreboard. You then record the total score for each turn in the outer column and then subtract that number from the total score and update the remaining score in the inner column. The remaining score should be noted after each turn. To start a game of 301, you must first hit a double of any number on the board. You cannot start subtracting from 301 until you have accomplished this. To start 501, you just need to land a single of any number before you can start subtracting from the total. In both 301 and 501, and all 01 games for that matter, you win by doubling out to reach zero. The best way to do this is to aim for high scoring numbers (i.e. 20, 19, 18) and then understand the best out combinations to make a quick exit. In an 01 game, the game ends as soon as you or your opponent hits the double required to reach zero. Subsequent darts do not count. A “Bust” happens when you score more points than needed to reach zero. If that happens, you just go back to the score required prior to your turn. This is also the case is if you end with 1 point left, since this number cannot be halved, or if you reach zero without doubling out. 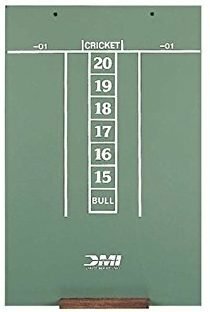 In the game of Cricket darts, you only score based on the numbers 20, 19, 18, 17, 16, 15 and the inner and outer Bull. You must score three of a given number to close that number. 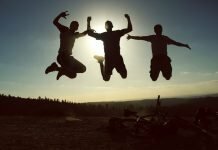 This can be done with three singles, a double + single, or a triple. Once you close a number, you can score points on that number until your opponent closes the same. The double and triple count as 2 or 3 times the numerical value of that number when keeping score. You add the scores to the previous balance in the outer column of the scoreboard. To close the bull, the outer bull counts as a single and inner bull counts as a double. The numerical value of the single bull for scoring is 25. The bull’s eye is worth 50 points. The numbers in Cricket can be closed and scored on in any order. Of course, you may modify this rule by agreement before the game (for example, decide if you are playing in order and that all shots must be called). Like all other dart games, you must verify and record your score before removing darts from the board. In Cricket, you win once you’ve closed all the numbers and have the highest numerical score. If both sides are tied in points or have no points, the winner is the first to close all the numbers. If you close the numbers first but are still behind in points, you must continue playing until you’ve exceeded your opponent’s points in order to win. 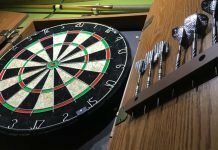 This quick review of basic darts scoring rules, etiquette and practice for 301, 501 and Cricket will give you a foundation for most games played on a dartboard.